Paddy Madden thinks he should have been one of the League One players selected by Republic of Ireland Ireland boss Mick McCarthy after missing out on an international call-up. Luton Town’s James Collins, Porsmouth’s Ronan Curtis and Newport County striker Padraig Amond were all selected in McCarthy’s initial squad. 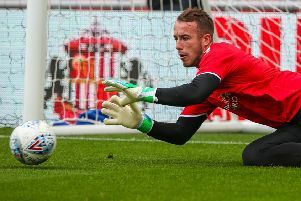 Amond made the final cut for the Euro 2020 qualifiers against Gibraltar and Georgia but Curtis pulled out of the squad because of a finger injury. That meant another League One man, Charlton Athletic’s Josh Cullen, earned a call-up instead. Madden has netted 18 times so far this season for Fleetwood but his only cap came in 2013 when he was playing in the Championship for Yeovil Town. Given that McCarthy is now looking at players in League One and below, Madden thinks he should be in contention given his goalscoring records for Yeovil, Scunthorpe and Town. However, as he prepares for a weekend off with Town not in action, the Dublin-born forward says he will not be dwelling on the snub and is concentrating on firing his side further up the League One table. He said: “Over the years, I have scored the most of my goals in League One with Yeovil. “Then I went to become a Championship player, I got called in. “They always had that kind of (rule) where it was just Championship or higher to get in the squad. “Now that they are picking League One players it is a bit of a frustration. “I have done so well in League One over the years and you do feel like you are being skipped a bit. He added: “Football is a funny game. “It is a game of opinions and there must be something that he (Mick McCarthy) does not like about my game at the minute.